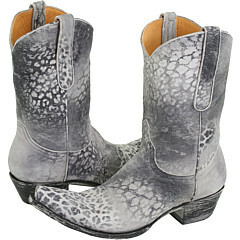 * Show off your stylish, wildish side in this gorgeous Western style boot! * Distressed Leopard print leather upper. * Leather outsole with rubber heel tap. * Old Gringo® boots go through a 130 step handmade production process. * Old Gringo® also develops and tans its own leathers and textures to make sure the end result is a super high quality product. Since 2000, Old Gringo has been focused on a single goal: combining the best materials with the most highly skilled craftsmen. Beautiful designs and comfort are not accidents. It’s all about bonding a time honored handcrafting art and a contemporary flair for fashion. Old Gringo strives to give their customers a product that embodies style and quality. Founders Yan Ferry and Ernie Tarut decided to combine Yan?s bootmaking and design skill with Ernie?s years of experience in leather manufacturing to create boots of superior style and quality. Thus Old Gringo was born. The first Old Gringo factory opened in 2000 with a collection of original, vintage and retro styles. These styles bridged the gap between western style and pure fashion.